But we're far from perfect. Canada's reputation for giving women equal opportunity in government positions soared when Justin Trudeau was elected prime minister in 2015 and announced his intention for a gender-balanced cabinet, and two years later, that still holds true. A recent survey from Global Government Forum (GGF) found that Canada led those countries in gender equality in senior civil service positions, with a 46.4 per cent female workforce. Australia was close behind with 43.3 per cent, and South Africa came in third at 41.1 per cent. The U.K. (40.1 per cent), Brazil (37.8 per cent) and the United States (34.4 per cent) followed behind. The study averaged out the number of women in the top five levels of seniority, choosing to look at the decision makers with the most potential impact. In terms of why this still matters, as Janice Charette, the Canadian High Commissioner to the U.K., told the researchers, "the public service needs to represent the population that it's serving in order to do the very best job that it can." And since women represent 50 per cent of the population, and the workforce, worldwide, that makes good social sense. Educated women who are not in the workforce represent a potential [global] GDP increase of about $12 trillion. It's also happens to be good business. 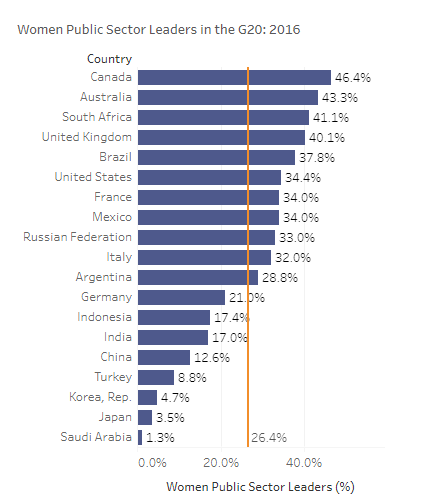 When Mercer, a human resources consulting firm, looked at the impact women could make on the economy, they found "educated women who are not in the workforce represent a potential [global] GDP increase of about $12 trillion." Japan, the second-lowest in government positions for women, has struggled with getting women into the workforce, negatively affecting its economy, reports CNN Money. In areas other than high levels of government in Canada, mind you, women still aren't proportionately represented, with women holding only 35 per cent of managerial positions and owning 20 per cent of the country's small businesses. And then, of course, there's the gender wage gap. 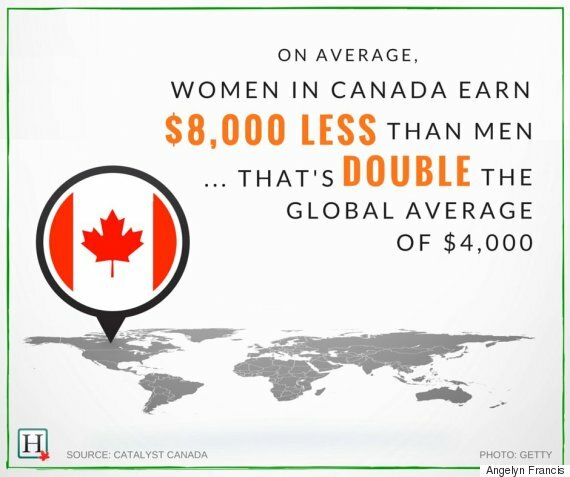 Last year, Statistics Canada reported that women earn 73.5 cents for every dollar made by men (twice the global average) and experts say progress that had been made since the '60s and '70s has plateaued. And Indigenous women and women of colour make even less. But if change happens from the top, then at least we can hope Canada is in a good position, in a way that can benefit the entire country and keep us moving forward. "In my experience, I have found that having a diverse team around the table — a gender-equal team — meant that the discussions and decision-making processes tended to be more collaborative," Charette told GGF. "When you have more and different perspectives around the table, the discussion becomes more sophisticated."